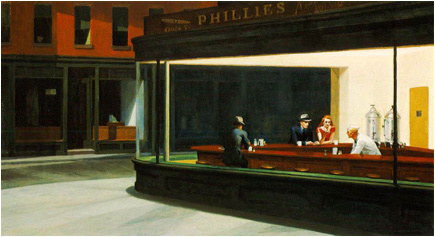 With revered masterpieces like Nighthawks and Early Sunday Morning, Edward Hopper has left an enduring mark on the history of art. During his lifetime the artist was often obscured by more vivacious styles like Abstract Expressionism, but Hopper always remained true to his own artistic vision and today is acclaimed as a major force in modern American art. Edward Hopper was born in 1882 in Nyack, New York to a strict Baptist family. The introverted young man decided to become an artist in 1899, but complying with the desires of his family went to study commercial illustration at the New York School of Illustration and then the New York School of Art. In 1924 Hopper married his fellow art student Jo Nivisin, a vivacious actress turned painter with whom the artist maintained a tempestuous but inspirational relationship. Hopper had his first major success in the same year, with his second solo show at the Rehn Galler in New York, a complete sell-out. 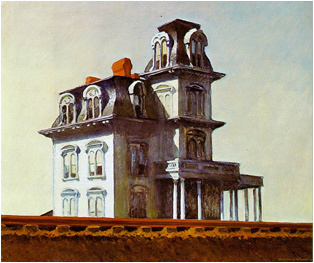 In 1930, Hopper’s first mature master work, The House by the Railroad, entered into the Museum of Modern Art’s permanent collection, and the Whitney Museum acquired Early Sunday Morning. These two breakthroughs were followed by Hopper’s first retrospective at the MoMA in 1933. With age Hopper found it increasingly difficult to find inspiration for his paintings, and near the end of his life suffered from total creative impotence. His resentful resistance to abstraction labeled Hopper as an out-of-touch conservative, and the artist came to be overshadowed by the young, compelling artists of Abstract Expressionism. 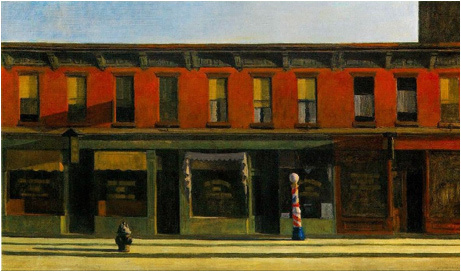 In 1967 Edward Hopper died in obscurity, followed by Jo ten months later. Oil on canvas, 60.9 x 73.6 cm. 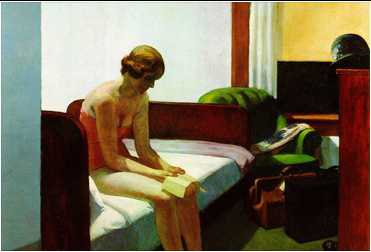 Hopper’s style is distinguished by its realism, careful attention to detail, and a strong interest in chiaroscuro and the effects of light (the result of Impressionist influence). His works often evidence his past as a commercial designer in their bold, simple design and reduced palette. Oil on canvas, 152.4 x 165.1 cm. Oil on canvas, 76 x 144 cm. Oil on canvas, 88.9 x 152.4 cm.